The concept of the new SOLAAR M Series is simplicity itself - a Stockdale double beam optical system, each beam passing through a separate atomiser. The user defines which is the sample beam - hence which atomiser is selected. Flame to furnace changeover can, therefore, be totally automatic - no manual intervention whatsoever. Alignment is perfect, productivity is significantly enhanced and performance guaranteed. No wasted energy and single beam performance with double beam stability! Unrivalled flame sensitivity is guaranteed. A combination of fully inert spray chamber, impact bead, spoiler and Pt/Ir nebuliser is suitable for all flame and sample types and provides high efficiency nebulisation. The super cool, high solids Universal burner ensures exceptional atomisation. The automatic gas control management system employs binary flow control, providing reliable repeatability for all flame conditions. Automatic burner height and gas flow optimisation ensures simplicity of operation. Even the optical instrument parameters may be optimised automatically. SOLAAR M Series offers a choice of either conventional or AC Zeeman graphite furnace to provide unrivalled analytical detection power with minimum interferences. Both systems employ dynamic optical temperature control to achieve heating rates in excess of 2000oC per second, independent of cuvette age. New graphite technology has resulted in Thermo Elemental's unique Extended Lifetime Cuvettes (ELC) with up to ten times the lifetime of alternatives - uninterrupted overnight analysis which also proves surprisingly cost effective. Pre-heated cuvette injection, coolant water temperature compensation and fast furnace operation are examples of the attention to detail which ensures perfect analyses. 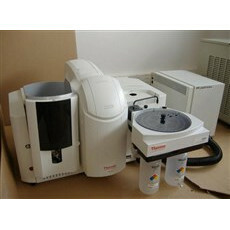 Find online auctions and classified ads for Thermo AA Atomic Absorption spectrometers on LabX.